St. Martin's Press, 9780312321741, 272pp. Famed for its bustling cities rich with art, history, and centuries-old traditions, as well as for its gently rolling landscapes filled with vineyards, cypress trees, and olive groves, Tuscany is one of the most popular regions in Italy. Mary Ann Esposito, host of the longest-running television cooking show, invites us to experience the tastes, smells, and traditions of this wonderful region, one delectable meal at time. With eighty delicious recipes accompanied by anecdotes, travel essays, and cooking tips and techniques, this collection shares and explores the essence of Tuscan cooking. Cucina povera, country-style cooking, is the backbone of the Tuscan culinary heritage, and you'll see it in practice on an agricultural estate just outside of Siena, at a palazzino in the heart of Florence, at a popular restaurant in an industrial city, in medieval villages, and in the charming cities and towns across the region. Simple, flavorful ingredients are transformed into authentic, mouth-watering dishes such as Scarola e Fagioli (Escarole and Beans), Pappa al Pomodoro (Tomato Bread Soup), Patate con Olio e Ramerino (Potatoes with Olive Oil and Rosemary), Bistecca alla Fiorentina (Grilled T-bone Steak), Gnocchi di Patate con Salsa di Pecorino e Panna (Potato Gnocchi with Pecorino Cream Sauce), Panforte, Ricciarelli di Siena (Siena-Style Almond Cookies), and much more. Complete with information on mail-order sources, Web sites, and Tuscan restaurants, this celebration of the region of Tuscany is a tribute to the people practicing and preserving its rich culinary traditions.
" Delicious...Page after page of charming stories, photos, and mouth watering recipes invite readers to come and explore this lovely region with their favorite cook as a guide. No one has done more to introduce us to the pleasures of Italian cooking than Mary Ann." " Mary Ann Esposito's love of Umbria and its rich culinary traditions shines through on every page. Vive Umbria! Viva Mary Ann!" "Real Italian food comes from the home, and Mary Ann Esposito invites us to accompany her on a journey through the authentic home cooking of her favorite regions of Italy. Her food will warm the heart as well as the belly of those who prepare it." "It is from great colleagues like Mary Ann Esposito that I can learn something new every time I step into my kitchen. She is an indefatigable culinary scout, an acute observer of foodways." 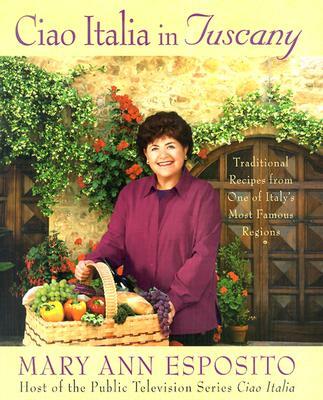 "Mary Ann Esposito has been a pioneer in the world of cooking shows. Ciao Italia is authentic and entertaining, like a great Italian meal, prepared for and eaten with friends and family."